The Monster Pump (モンスター・ポンプ?, lit. : "Monster Pump") is a treasure in Pikmin 2. It is actually a water tap with an attached pressure gauge. It is found on the last (14) sublevel of the Dream Den, and is held by the powerful Titan Dweevil. It must be knocked off by dealing enough damage. 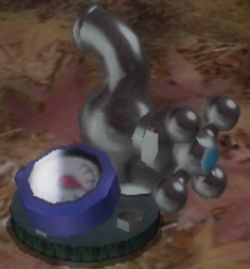 It shoots out blasts of water via the tap, which can be avoided by watching the shadows of the drops carefully and moving if the shadow comes to the Pikmin. Continually switch leaders to make sure no Pikmin are drowning while this is being fired. When the Monster Pump is close to being knocked from the Dweevil, it will fire drops of water at a much faster pace. This is one of the five treasures that are tied for second in their value. Artwork of the Monster Pump. The Monster Pump being held by the Titan Dweevil. The Monster Pump after being dropped. The Monster Pump being analyzed by the Hocotate ship. A pressure gauge from the real world. A water tap from the real world. Early version of the Treasure Hoard icon. This page was last edited on December 12, 2018, at 08:20.